Looking for a one-stop-shop for information about working in Australia’s public services? Are you applying for a job in the Australian Public Service but can’t figure out how to go about it? Do you under-sell yourself due to lack of confidence, reluctance to promote yourself or not having the right words to present what you have to offer? Are you part of a selection panel but unsure what to do? Do you need to keep up-to-date with the latest in what’s happening to recruit, select and retain your staff but haven’t got time to do the research? Unravel the mysteries of applying for public service jobs. Unlock your talent and potential so you can confidently present a convincing case. Unpack research to inform your search for talent. Unveil the myths about selecting staff based on merit. Applicants, career development practitioners, managers and selection panels will find free articles addressing current issues. You’ll find information about books and audio products, and coaching. 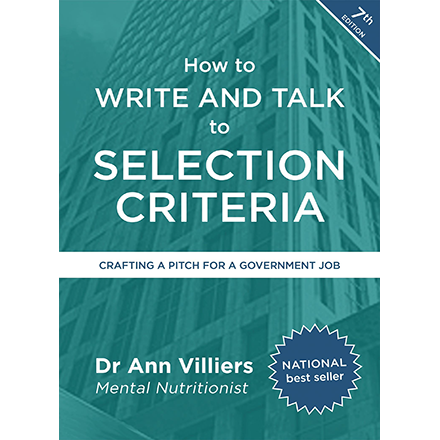 This material is provided by Dr Ann Villiers, Mental Nutritionist and author of national best-seller How to write and talk to selection criteria, the most authoritative resource on selection criteria, now in its sixth edition, with proven results over more than a decade. These services and free resources direct you to good practice in recruiting and selecting staff, and give you the tools and techniques for increasing your chances of job success in the public service. Abstract: Four Canberra-based projects were examined to explore the significance of interpersonal skills in technical occupations. The importance of interpersonal skills and demands for teamwork, cooperation and collaboration during projects was confirmed. The implications of skill terminology, career practitioner advice, occupational information, and gendered career choices are explored. The research points to the need to shift thinking about skill distinctions to give greater recognition to interpersonal skills in technical occupations. Read the report here. Revised, updated and extended, this current digital edition prepares a public sector applicant for 21st century skills, in an online environment, with a focus on value, results, and contribution. Based on a sense-making framework called Mental Nutrition, and a career management perspective, this edition shows you how to manage your public sector career, how to write evidence-based, results-focused, job-matched résumés, applications and expressions of interest, and how to present a convincing case at a job interview. More than 300 pages. (40+ more than the 5th edn.) Available in Epub and PDF formats. Still only $25.00. Are you skilled in contextual analysis so you can make a case for ‘Why you’? Can you craft a value-rich expression of interest/statement of suitability in 2 succinct pages? Do you understand the capability frameworks that apply in the APS, in your state or territory, in your profession? Can you prepare responses on strategic thinking, policy, leadership and management? Are you up-to-date on changes in public sector value statements, on social media policy, and ethical dilemmas? Can you accurately read an online public sector job advertisement so you don’t miss vital details? If you answered ‘No’ to these questions, then you could be jeopardising your next career move. Contextual analysis is now the basis of a strong application with particular attention to four work characteristics: volatility, uncertainty, complexity, and ambiguity. The sixth edition helps you understand the nature of complexity and how it applies to judging seniority level, leadership and example choice. This brochure gives more details on the new edition. Read about the risks of relying on out-of-date advice about addressing selection criteria. This brochure lists Mental Nutrition products. How to Write and Talk to Selection Criteria Fifth Edn. received Highly Commended in the Non-Fiction section of the ACT Writing and Publishing Awards.